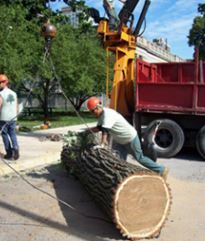 Horigan Urban Forest Products of Skokie, IL, has been blazing trails in the utilization of urban wood for 15 years. In recent years the Horigans moved into larger quarters that includes a sawmill, warehouse and retail operation. Erika Horigan, who co-owns the company with her husband, Bruce, discusses how Horigan UFP got started and her enjoyment in seeing felled community trees get a second chance as lumber and wood products. 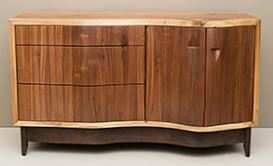 Read about the company’s success on UrbanWoodNetwork.org. Horigan Urban Forest Products Inc., one of Chicagoland’s longest-standing urban wood enterprises, has redesigned its website: www.horiganufp.com. Horigan Urban Forest Products is owned and operated by the husband-wife team of Bruce and Erika Horigan. The company received the Governor’s Pollution Prevention Award in 2007. Bruce Horigan, a certified arborist since 1979, was honored with a Special Recognition award by the Illinois Arborist Association in 2008 for advancing the cause of wood recycling in the urban environment. The company mills and dry kilns lumber, slabs and burls. The products are sold to professional woodworkers, hobbyists, consumers and others at its facility at 7255 N. St. Louis in Skokie, IL. In addition, Horigan Urban Forest Products makes flooring, custom furniture and specialty items like picture frames and bowls from community trees. Horigan Urban Forest Products is open 9 a.m. to 5 p.m. Monday-Friday and 10 a.m. to 3 p.m. on Saturday. Phone 847-568-1340 or visit the website, where you can also request to receive the company’s newsletter.